What does one do with blank top paper? Blank-top paper is useful for more activities than I am about to suggest. To sum up almost everything in one sentence, Typically one can draw on the blank top area of the paper and write something about the drawing on the ruled area of the paper. The paper named 1/4 inch Tall is not symmetrical. The lowercase part of the rule is 1/8 inch, as it should be for a 1/4 rule, but the other two areas of the rule are taller. The uppercase part is 3/16 inch tall and the lowest part of the rule is 1/4 inch tall. Blank top paper is a much requested paper. 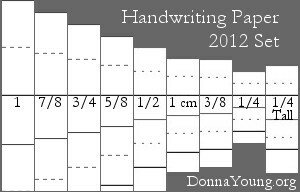 The lower portion of the printable has handwriting lines and the upper part is blank so the child can draw a picture. This style is available in 4 sizes. The vertical grayscale blank top files are linked below. The rule height is in this order: #1 is the narrowest rule and #4 is the widest. The handwriting paper printables here have a pink line as the letter base line. Choose from horizontal or vertical or both. The ruled lines are in 4 sizes. Love this nice pink and blue paper. The sizes listed are approximate. Is there more at donnayoung.org? Yes, of course there are more blank-top printable paper choices at DY. I can't put it all on one page! 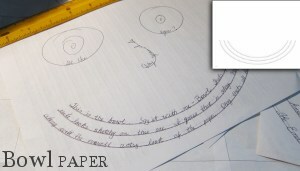 AND If you want to make your own blank top paper keep reading. The two fonts linked below can make handwriting rule provided that the fonts are installed on your computer and you have a word processor. At the two articles linked below, I explain how to use those fonts. You're welcome!